Usually the first symptom to be noticed by the caretaker is swollen joints in the feet or toes and lameness, with affected birds being unwilling to land, stand or grasp normally with one or both of their feet. First Stage - Pink "calluses" appear. These abrasions to the lower surface of the foot feel hard and typically affect both feet. These "calluses" look like small pinkish or reddish areas or shiny patches that can show up on top as well as on the bottom of the feet. They are most often caused by inappropriate perches - such as hard plastic or dowelling perches or rough, sandpaper covered perches - or by perching on the same surfaces for too long. Second Stage - Sores / lesions: As the affected feet have lost their protective scales, bacteria (usually staphylococcus bacteria) on unclean perches or other surfaces the birds come in contact with result in an infection. The sores become redder and more inflamed. At this point, antibiotics are most likely needed, in addition to addressing the initial problem that caused the issue. Third Stage - If the first and second stages aren't addressed, penetration may occur. The sores turn dark blue or black. Severe distortion of the foot and/or toes and permanent damage to the foot or feet occurs. Birds experience pain and discomfort, and they will be seen lifting up their feet to help relieve their discomfort. Birds become severely lame, and surgery (in addition to treating any underlying issues) is usually the only chance fora completely recovery. Depending on the diagnosis, a vet may recommend changes to a bird's diet or cage setup; prescribe hot soaks or antibiotics, and / or make dietary recommendations. In some instances, surgery may be indicated, especially in cases where severe distortion of the contours of the foot and/or the toes has occurred, as these have the potential of causing considerable damage in the foot. Perches / Surfaces: Unsuitable and unclean perches / standing and walking platforms - such as plastic perches, sharp-cornered perches, rough "pedicure" perches, standard perches with uniform diameter or wire floors - need to be exchanged to instead provide clean and VARIED perching surfaces. Natural perches with different circumferences and textures are preferred. Birds should be encouraged to perch in different places and varying surfaces. This can be achieved by placing food and water dishes in different areas, changing the position of the different perches, etc. Hard or wire flooring should be covered with newspaper, soft towels or some other material to protect the feet, facilitate a more comfortable walking on the floor and speed the healing process. Any surfaces a bird touches should be carefully sanitized and kept clean. Infections: Where some penetration has occurred, infections are likely to occur. Bacteria, including staph, have been identified in some rare cases of bumble foot; in particular, if the wound hasn’ t been noticed and treated before it becomes acute. If the infection is serious enough, antibiotics will be needed - such as erythomycin, penicillin or pipercillin injections, etc. (as described by the vet), in addition to anti-inflammatories and antibiotics topically applied to the feet. Before applying any topical antibiotics / treatments, the lesion needs to be thoroughly cleaned. One recommendation involves soaking the affected foot in a shallow dish filled with warm water with Epsom Salt added to it. The recommended strength is about one teaspoon of Epsom Salt mixed in with one gallon of clean, warm drinking water. The Epsom Salt will draw out any toxins. Soaking the foot or feet will soften and remove any scab, which allows the lesion to drain any pus and debris. Finally, flush the cavity with hydrogen peroxide to clean the wound out and destroy any bacteria. Once the wound is clean, apply liberal amounts of an antibiotic ointment as prescribed by the vet (often CEH ointment [Calendula, Echinacea and Hypericum]); and then carefully wrap the foot or feet with gauze to keep the cavity clean and the ointment in place, and prevent the bird from chewing on it. If the "bumblefoot" is in the very severe category, a ball bandage may need to be adhered to the foot. The lesion needs to be cleaned and ointments reapplied twice a day until the feet appear healthy. If left untreated, the infection will eventually eat into the bone and travel to other parts of the body. This is a painful condition that can potentially be life threatening. Swelling: Some breeders report success in reducing the swelling by applying hemorrhoid cream to the affected foot. However, the underlying problems still need to be addressed. Poor quality diets result in malnutrition and obesity. Fatty diets and diets that are high in cholesterol or protein; or diets low in calcium are all associated with bumblefoot conditions. 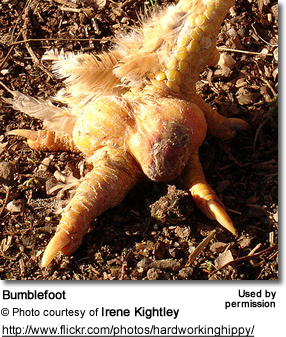 Vitamin A Deficiency: Some forms of bumble foot are caused by a vitamin A deficiency. Budgerigar, or other birds mostly feeding on seeds, are particularly susceptible to it. Seeds are typically low in vitamin A. This vitamin promotes appetite, digestion, and also increases resistance to infection and to some parasites. The most obvious sign of a vitamin A deficiency is a feather stain above the cere. The staining of the feathers above the nostrils reflects a discharge from the nostrils. Subtle differences may be seen as far as the color intensity of the cere and feathers is concerned - and the overall condition of the plumage. A bird deficient in this vitamin may have pale, rough-looking feathers that lack luster. The cere may look rough instead of smooth, and you may see an accumulation of a yellow dry scale on the sides of the beak. Cause of action or preventative measures: Birds usually respond quickly to the supplementation of vitamin A. Owners reported that once the nutritional deficiency was resolved, the feather condition and overall well-being improved drastically - within several days in fact. Excess Protein: Stored, excess protein promotes the growth of internal bacteria which are excreted through the skin. In areas where there are feathers, those feathers will usually absorb the protein. In bare areas, such as the feet, these bacteria will present themselves as pink, red and then blue "calluses." These most often show up on the bottom of the feet; however, may also appear on the top or on the tips of the toes, above or under the bird's toenails. It is important to reduce the protein in the bird's diet to stop the progression of this condition. Once the condition has been resolved, it is important to keep an eye on the patient(s) and these areas in particular to make sure that the problem isn' t recurring.